The year of 2018 is very quickly coming to a close, and like the past several years, I am doing this post to honor the horses that have died in 2018. The list is shorter then it was last year, but no less painful. Even though several of those that passed in 2018 were very young, their memory will not be forgotten. We didn’t get the chance to watch them grow and develop a strong presence on the mountain, but the lucky few that saw them and recorded their existence can remind us all of who they were. Thank you to those that allowed me to use their photos. Below are the horses that have died (or are missing) in 2018. 1. Blue Moon (Flint). 2001 son of Shaman and Sitka. While Blue Moon has not been gone the official length of time to be declared deceased, all of that witnessed his deteriorated condition this past summer, can recognize that he most likely is gone. He not only lost his band last winter/spring, but he somehow got injured. He seemed to have a back/spinal injury that appeared to be very painful. Not only the physical injury, but it was also very clear that his spirit to live had greatly compromised. He was one of those stallions that just couldn’t settle into bachelorhood again. His heart was broken at the loss of his band. I have many, many fond memories of Blue Moon. He and his band were frequent early morning/late evening visitors to my campsite. They seemed to recognize my truck, Abbie and myself. Blue Moon was the type of horse that if he could, he would have pulled up a chair and asked for a cup of coffee, and talked to us for hours about life. And his life was full of stories, he struggled as a young bachelor to devote full attention to his band. That lead for some painful memories for him, but in the more recent years, he became a devoted caring band stallion that gave his every minute to the care of his band. 2. Morning Star. 1996 son of Washakie and Plenty Coups. Morning Star lost his band one final time in the fall of 2017. (After losing them and winning them back in the spring of 2017). I don’t believe he was seen after that. He was looking quite thin in the summer of 2017, so without his band and his strength, he was not able to make it. Morning Star was a strong band stallion, who kept his band together. His death lead to the separation of his band, and as current as last week, it has been reported that they are still in constant turmoil. Morning Star was a strong presence on the mountain and will be greatly missed. Kemmerer (2010 Sacajawea X Blizzard), and Sacajewea, spring 2012. 3. Sacajawea. 1996 daughter of Three Bars and Calamity. Sacajeawea has not been seen since June 2018. She has always been a strong independent mare, often setting out on her own and changing bands. She was by far one of the oldest and strongest bloodlines that the Pryors had. Her beautiful primative markings and gorgous Grulla color always took my breath away. Kemmerer, Sacajewa and Seattle. Spring 2012. 4. Sparrow. 2018 son of Pele (Penny) and Irial. Born the week of May 14, missing May 20, 2018. No photo available. 5. Stargazer. 2018 son of Quartz, father unknown. Born week of June 3. Died June 6. 6. Shamrock. 2018 son of Pegasus, father unknown. Born the week of May 20. Discovered missing by Abbie and Sandy, June 21, 2018. Abbie and I were both so excited to look for Shamrock and so shocked and disappointed when we discovered her missing. Shamrock was a beautiful foal and seemed strong. But Pegasus (whom I discovered and named!) was with an unexperienced new band stallion (Missoula, whom I discovered and named!). I am uncertain about what happened to the Sparrow and Stargazer, but I am quite certain that Shamrock was taken by a mountain lion. A few days after we discovered her missing, Abbie and I came across a large blood patch and drag marks with blood. While we can’t be certain, we concluded that it was most likely that of Shamrock. 7. Santiago. Son of Labrava and Irial. A beautiful strong colt, Santiago should have survived. Abbie, I and my last guests of the season discovered this little beauty early on the morning of our last day. We can only speculate what happened to this beautiful foal, born to a large strong and stable band. There was and is a lot of young bachelors pushing for a band of their own. Abbie and I witnessed several very dangerous pursuits involving several bands at a time. There were also several people on the mountain at the time. Did Santiago get separated and injured from a bachelor confrontation? Did he get separated from people approaching too close ( like a foal from 2017?) There were conflicting reports of what happened. Only the mountain knows for sure, either way, this colts life ended way too soon. His death haunts me. Rest in Peace wild ones. Your spirit still runs free on the mountain. I am a little late announcing this birth. I did post on Wild In The Pryor Facebook page, shortly after he was born, but was waiting for just the right photos to announce it here. These photos were taken this week by Brittny Budde. Thank you so much Brittny for letting me use them! Pryor Foal # 11 for 2018 was born to Feldspar and Mescalero. Feldspar is the 2005 daughter of Rosarita and Starman. Mescalero is the 1999 son of Sitka and Shaman. The foal is a colt and he has been named Sirius. He is named in honor of his grandfather Starman. Sirius is a star system and the brightest star in the Earth’s night sky. Welcome little one. I hope you are able to shine on the mountain top your entire life. Note: June 8, 2018. It is with great sadness that I have to report that little Stargazer died. Every year I try to remind myself not to get too attached. But for some reason, this little one really tugged at my heart. I hadn’t even met him yet, but still, there was a special place for him in my heart. Quintana may have been a very young mother, but I was told she cared deeply for him. Rest in peace little one. Another two year old filly has given birth in the Pryors. Quintana (Quartz) has given birth to a colt, at this time the father is unknown. His name is going to be Stargazer, in memory of his great-grandfather Starman. Quintana (Quartz) is the 2016 daughter of Feldspar and Mescalero. It is amazing that Mescalero is now a grandfather! Quartz is Mecalero’s only known offspring, so it is important to keep his line going, especially since he is now 19 years old. Quartz and her new colt! Thank you Dennis McCollough for the use of your photos! It is very appreciated! I am counting down the days until Abbie and I will be there to see these little ones for ourselves! 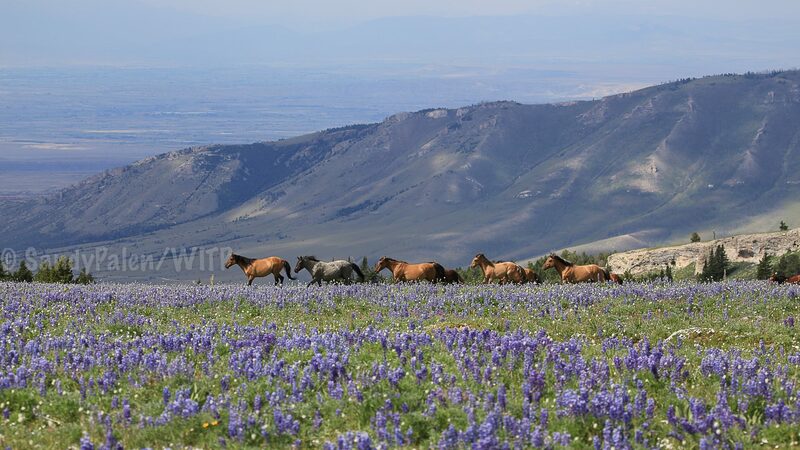 I realize we would not want these births by these young filly’s to happen, but I will still be happy to see these little ones playing in the wildflowers! Especially after all of last years pain and loss of the foals. The 7th 2018 foal has been discovered! This foal was born to two year old, Quillan. Quillan is the 2016 daughter of Ireland and Galaxy. The father of this foal is unknown. She has been named Silver Bow. Quillan and her filly. Photo by Dennis M.
3 Generations! Ireland, Quillan and her filly. Photo by Dennis M.
Thank you Dennis McCollough for the use of your photos! Abbie and I will be on the mountain very soon! I can’t wait to see this little one in person! Two more foals have been born on the mountain. Both were born to three year old filly’s. How did that happen? They were supposed to be vaccinated to prevent this. Let’s take a look at how that may have happened. In 2016, an east coast group (Friends of Animals) filed a lawsuit against the BLM. This lawsuit caused the delay of the 2017 PZP vaccines until later in the spring. I believe this is what caused both of these 3 year olds to give birth. As a three year old, they need to have two injections, spaced a few weeks apart. Penny was given her first booster on 4-17-17, her second was given on 5-4-17 (she was already pregnant by then). Pegasus was given her first booster on 3-29-17, her second on 4-14-17. While she was not pregnant yet, there may not have been enough time for it to become effective. After the first year, the mares only need one injection each year. This should be noted on their records, and not be held against them when deciding who and if they should be removed. The fifth 2018 foal has been born to Penny (Pele) and Irial. Penny is the 2015 daughter of Fools Gold and Coronado. The foal, a colt, was born the week of May 13. The name Sparrow was chosen for him. I will post photos as soon as I can get some recent ones. At the time of this post, I had been informed that he was missing and presumed dead. Rest in peace little one. The sixth 2018 foal has been born to Pegasus. She was born this week. Pegasus is the 2015 daughter of Ireland and Galaxy. UPDATE: When Abbie and I got a glimpse of Missoula and his band just down the road, we were very excited! I couldn’t wait to see Shamrock. Unfortunately, it was not to happen. Sometime between Sunday June 17 and the day we saw them (Tuesday June 19), Shamrock disappear. Another heartbreaking discovery. Rest in Peace little one. Pegasus holds a special place in my heart. I was one of the first to see her, shortly after her birth, and I was able to pick her name. Pegasus has had a rough winter/spring, somehow being separated from her family band with her sister Limerick. At the time of her foals birth, Pegasus was with the young stallion Missoula. (another that I was lucky enough to name!) An unexperienced filly with her first foal, along with an unexperienced stallion, is not an ideal situation, I am hoping for the best for this young mother and her filly. Limerick, Shamrock and Pegasus. Photo by Dennis McCollough. Time will tell who the likely sire is to this foal (color will give us a better idea). As of now, I will say sire unknown. My first reaction was that no other horse could get close enough to Galaxy’s band to breed her (meaning the foal would be Galaxy’s). But Galaxy had his hands full last year, and I do believe that a determined bachelor could have zoomed in and bred her while Galaxy fought with another. But for now, I only hope that both mom and foal will be okay. Thank you to Dennis McCollough for the use of his photos! Each horse on the range has their own story, but the birth of this foal is a bit more special than most. Not only does this foal represent rare blood lines, but also shows the success of a mountain horse relocating to the Dryhead, providing a genetically viable new bloodline among the Dryhead horses. In 2009, almost the entire population of Pryor Horses living in the Forest Service part of the range were removed. A few were able to escape this removal. One of the horses was a young bachelor named Hamlet. Hamlet was born in 2007 to Delilah and Pierre. In 2014, Hamlet acquired his first mare. A mare named Audobon. Audobon, born in 2000 to Feather and Challenger was not only the only offspring of this pair, but the only offspring each would have. In 2015, Audobon and Hamlet produce a beautiful filly named Penn (Abbie and I call her Paris). This birth alone was a reason to celebrate. The following year Audobon and Hamlet would have another foal, Quicksilver. Quicksilver he would not live long and that following winter, Audobon disappeared as well. Hamlet with the young filly Paris (Penn), on the left. July 2016. During the disruption of Hamlet’s band, the young Paris ended up in the Dryhead, (the desert part of the lower mountain) with the stallion Jesse James, who claimed her for his own. Jesse James also has a very special story. He is the son of Seneca (part of the Greeters) and the late Admire (who was killed by a drunk driver in 2011, along with his son Kapitan). Jesse James is the only remaining offspring of Admire and Seneca on the range. Admire and his band were the first wild horses I ever saw when I drove up the Dryhead for the first time. Here is a link to my blog piece about the judgement against the person who killed them: ADMIRE Within that post is a video I made, where you will be able to see Admire with his band, including a young Jesse James. Along with Paris, Jesse James has Cecelia, a very wise mare who was with the stallion Sitting Bull for many years. (he died in the winter of 2015-16). Unlike Jesse James’s very visible years with the Greeters, he and his small band have been seen very little and mostly from a distance. When Cecilia and Sitting Bull were together, they were rarely seen, often referred to as the “wildest of the horses on the range”. I am sure this is the reason why Paris became pregnant at the age of 2, this band could not be found or approached close enough for the administration of the PZP vaccine. Last summer Abbie and I were able to spot this elusive band from a distance. Cecelia, Paris( Penn) and Jesse James, June 2017. Can you spot them? Find the fence on the right and follow the ridge to the left. Sitting Bull, Cecelia and Mateo, February, 2013. This 4th born foal of 2018 appears to be a colt. He is the son of Paris (Penn) and Jesse James. Paris is the 2015 daughter of Audobon and Hamlet. Jesse James is the 2009 son of Seneca and Admiral. He was discovered by Nancy Cerronni. He has been named Sentinel. The Greeters, April 2012 with Jesse James lying in front. Hopefully this summer Abbie and I will be blessed with a chance to see this family and continue to watch him grow wild and free on the range! Thank you Nancy for the use of your photos! The 3rd known Pryor Foal born this year has been found! Dennis McCollough report seeing them on Sunday. Thank you Dennis for the use of your photos! This foal and his mother have a very special place in my heart. This young mare was born to Jackson and Galena in 2012. (Making her Lakota’s granddaughter as well!) During the first winter of her life, she was separated from her family band. She ended up in Cappuccino’s band before her first birthday. Blanca looked after her like a mother, and she grew into a beautiful quiet mare that has remained with sturdy and handsome Cappuccino since that time. In 2016, Moenkopi foaled again. This time she had a filly named Quivira. She was born in September that year, and by the end of January 2017, she had disappeared. It is not known what happened. This past weekend Moenkopi was found with her 3rd foal. It looks to be a colt. His name is going to be Shoshone. Moenkopi is the 2012 daughter of Jackson and Galena. Cappuccino is the 2002 son of Rosarita and Starbuck. Moenkopi and Cappuccino’s new colt. Photo by Dennis McCollugh. I hope that this little colt survives and thrives on the mountain. I look forward to watching him grow up into a strong stallion. The second known foal was born this week in the Dryhead part of the range. Born to the “Greeters” of the BigHorn Canyon. The second foal of 2018 was born to the mare Nova and Hickok. Nova is the 2013 daughter of Kitalpha and Bristol. Hickok is the 2007 son of Belle Starr and Starbuck. Nova and her new foal. Photo taken by BHCRA Ranger, Todd Johnson. Thank you Bighorn Canyon National Recreation Area for the use of you photos! Who Will Have Foals in 2018? Mares within the Pryor Wild Horse Herd, are given PZP (birth control) every year. Each year there is a group of mares that are in the “window” of possibly being able to foal, meaning that they have not been given PZP. And every year, there will be some surprises from some, despite being vaccinated, and even though the below horses have not been vaccinated, it is not a guarantee that they will foal. Some have never conceived. Because some of the horses were vaccinated later than normal last spring/summer, it is possible that they may have already been pregnant, (before given their vaccination), but will not be “officially” listed here. I will start the list with the possible horses in the Dryhead. There are only two mares that fall into that window this year, and one has already had her foal! Jewel, 2009 daughter of Waif and Corona, currently in Fools Crow band. 2. Morgana, 2012 daughter of Icara and Merlin. She was discovered by Bill Picket, NPS with a new foal last week. The foal is supposedly a colt and it has been named Sorcerer. Morgana and her new foal. Photo by Bill Picket, NPS. Jasmine, 2009 daughter of Aztec and Cloud. Jamine gave birth to a healthy colt named Ryden in October of 2017. If she conceived right away, she may have a foal in September of 2018. Jasmine is currently in Doc’s band. 2. Juniper, 2009 daughter of Sapo and Bolder. Another late foal (Ruby) was born to Junipter the first part of November, 2017. Again if she did conceive right away, she won’t have her foal until October, 2018. I’m hoping she skips this year and gets back on track with a foal earlier in the season in 2019. Juniper is currently in Horizon’s band. 3. Kohl, 2010 daughter of Quelle Colour and Lakota. Kohl is currently in Garay’s band. 4. Ketchikan, 2010 daughter of Gold Rush and Two Boots, currently in Jasper’s band. 5. Limerick, 2011 daughter of Ireland and Prince. She is currently in Galaxy’s band. 5. Labrava, 2011 daughter of Blue Souix and Coronado. She is currently in Irial’s band. Labrava with her look alike daughter Pilar, June 2016. 6. Lariat, 2011 daughter of Madonna and Duke. Lariat is currently in Jasper’s band. 7. Maia, 2012 daughter of Hera and Prince. Maia is currently with Hamlet. 8. Manuelita, 2012 daughter of Dove and Coronado. Manuelita is currently in Irials band. Manuelita (middle) with Dove on the left. 9. Moenkopi, 2012 daughter of Galena and Jackson. She is currently in Cappuccino’s band. I hope this is the year that she gives birth to a foal that lives. Moenkopi nuzzling a young Patterson. June 2015. I am looking forward to seeing some new foals this summer. I am sure there will be some surprises! First Pryor Foal of 2018! Morgana and her new foal. Photo by Bill Picket, NPS, Bighorn Canyon National Recreation Area. The first Pryor Foal of 2018 was born to Morgana and (most likely) Johnston. Morgana is the 2012 daughter of Icara and Merlin. Johnston is the 2009 son of Cascade and Seattle. Morgana was expected to foal this year (according to the PZP program), so this was not an unexpected birth. It is a bit early, but with her living in the Dryhead, she should hopefully do okay. No word on name or if it is a colt or a filly. My friends Sarah and Abbie have suggested the name Surprise. I think that is would be perfect. It was the first word that I thought of when I saw this post on the BHCNR facebook page!! Click on Bighorn to see that post. Thank you to Bill Picket, NPS for allowing me to use his photo!